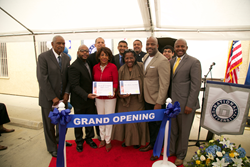 National University, a private, nonprofit university based in California, announces the launch of an innovative health clinic that uses the latest telehealth technologies to bring comprehensive medical care to residents of the Los Angeles neighborhood of Watts. Among the first of its kind, the clinic has been developed in partnership with UCLA and local faith-based and community organizations to make health care more accessible to residents through its unique “virtual” approach. “Innovative ministry is our local church's goal, and partnering with this cutting-edge medical approach through in-person and telehealth services allows the church to support the community and city in encouraging holistic health not just spiritually, but on all levels,” said the Rev. Marcus Murchinson of Tree of Life Missionary Baptist Church. Founded in 1971, National University is the second-largest private, nonprofit institution of higher education in California. With 30,000 students and more than 150,000 alumni, National University is the flagship institution of the National University System. National University is dedicated to making lifelong learning opportunities accessible, challenging, and relevant to a diverse population of students. Four schools and two colleges – the College of Letters and Sciences; the Sanford College of Education; the School of Business and Management; the School of Engineering and Computing; the School of Health and Human Services; and the School of Professional Studies – offer more than 100 graduate and undergraduate degrees and 23 teacher credentials. Programs are offered at locations throughout California and across the nation, and are also available online. National University is headquartered in La Jolla, California. To learn more, visit http://www.nu.edu.